Poking the Bull in the Eye, by Kay Urlich approaches global problems from an “energy” perspective. Speaking of the desired global consciousness change, the author speaks of merging “Energy Fields” with a developing communications platform (RealStew) that offers financial reward through profit-sharing – all for the purpose of global equality. She gets some things dead-right in my book but sadly, while she gets a lot closer to reality than many I see, she drops the ball badly when it comes to understanding the true nature of money. I grabbed a copy of the Kindle version free from Amazon – be quick and you too can do the same. The introductory offer is open until the 28th March. That’s a good move Kay – thanks. I’m very careful when buying books but you have my attention with that price! We’re also from neighbouring villages – her team has launched from the Waitakeres – Titirangi was where I spent my childhood. That draws additional interest from me of course. Writing any book is a mission. The core tenet of this book is that global change is required and the current Money Power are powerful, focused but “off-balance”. Her solution relates to balancing Energy Fields. 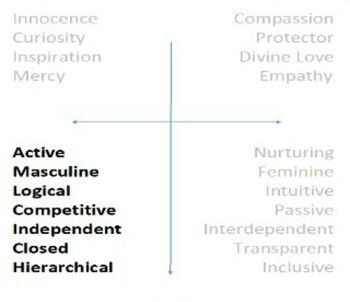 These energies (masculine, feminine, innocence, compassion for example) are defined into four quadrants. With a little bit of work [mental gymnastics] I grasped the essence of her teaching. It’s seems solid to me with aspects of truth, so far as I’ve managed to digest it anyway. I approach these subjects somewhat differently but well done to her none-the-less for explaining things how she did. I appreciated the extensive use of quotes which brought increased credibility and depth. Anecdotes and stories aplenty made for an interesting and easy read, albeit at the price of a less well defined message. The book reads a bit like a collection of philosophy, which she phrases this concept as “wisdom teachings”, rather than as a coherent single message. I’m not so sure that this would mean much to the author and her team but this is actually the essence of Jesus’ ministry too. Global change occurred when individuals loved one another [as He first loved of course]. As with most people touching on monetary reform issues (and this book certainly does) the author drops the ball when it comes to understanding the true nature of money. Young people in every country, need help to help themselves, based on the services or the goods they provide for other people. And this should be the basis for credit where you invest in their initiative. Kay is not wrong in saying this but her focus on young people is misguided for the world is made up of more than youth, and while decision-making will be theirs in the future, most decisions that affect global matters today are made by others. Youth need experience and mentors as well . . . which is of course where she plans to get their required capital. The principle is right, that development of a business and a future requires credit. Her application though has problems. Previously Kay had given a brief overview of the role of privately owned central banks which is sound, leaning on Christopher Houghton Budd’s teaching that the foundation of money is trade. The seeking of capital to commence business is definitely the basis of credit, rather than a central bank. The solution is for governments to extend credit to actual people, not institutions. You ask them: “What do you want to do in service to your fellow man, and how do we capitalize your initiative?” Such financial strategies create a new bond based on an ethic that money is lent only to young people on condition that they use the loan to realise their intentions. First the age thing is as I’ve said, a total red herring. Supporting youth is fine but capitalising ANY aged entrepreneur is also beneficial. The big problem with her thinking however is the mindset that something has to come from a government. Credit (access to capital) is a social issue, where trust is extended from one individual to another. Governments are simply representatives of the people, despite their attitudes and excesses to the contrary. Kay assumes that credit must come from a central authority. This is not correct. Credit issued by people for people (Mutual Credit) is the natural way of nature. Her focus on people-power in other disciplines is admirable. She needs to bring those same values back into the realm of economics and money, and she will get the breakthrough she seeks. The idea that money is a commodity and can be owned and controlled and thus ‘issued’ is a logical fallacy based on a deception. Money is only ever a record of a half-completed transaction. Nothing more – nothing less. Just as you cannot own, issue or control a litre, or a metre or a kilogram, neither can you own, issue or control money when you truly understand what it is. Money becomes a commodity only through deception, by inserting a control mechanism (a central bank or a government or similar) in between the two traders – the one(s) who extend and the one(s) who receive credit. The false mindset, or paradigm that thinks differently is widespread and has been the default setting of mankind for eons, for sure, but for one claiming to have wisdom and seeking to influence the world for good, Kay and her team should be digging much deeper. While money reform is only one part of the big picture it is a vital one, so my free eBook Mistakes of the Money Reformers would be a good start. Should the financial and political systems collapse (and they certainly will given time), her model will not only fail to provide a lifeboat, it will actively pull her people down. Mutual Credit systems in their various forms however have a much better chance, especially if they are unpegged from the current inflating financial measurement systems. People WILL eventually all be reverting to people-powered, decentralised, trust-based settlement systems out of necessity. Her desired global consciousness change will be occurring in due course, however not the way she prescribes in her book. Thanks again for the $0.00 Kindle version, Kay. * Urlich, Kay (2015-03-19). 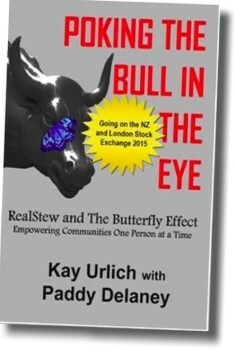 Poking the Bull in the Eye: RealStew and the Butterfly Effect (Kindle Locations 200-205). . Kindle Edition.